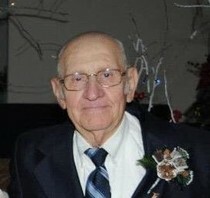 Jimmie Easterling age 87, of Ashland, passed away Thursday, March 14, 2019 at his residence. He was born October 30, 1931 in Olive Hill Kentucky, the son of Ephren and Georgeann (Wilson) Easterling. Mr. Easterling had been a resident of Ashland County since 1971. He had been employed with the U-Brand Corp for 22 years. He was a member of the Freewill Baptist Church. On June 10, 1953 Jimmie married Mary E. (Lawson) Easterling who preceded him in death in 2011. Survivors include his sons, Elijah Easterling of Ashland, and Glenn (Nola) Easterling of Nankin; his daughters, Edith Barker of Olive Hill, KY, Clarice (John) Steagall of Olive Hill, KY, and Pansy Easterling of Ashland; his 11 grandchildren, 13 great- grandchildren and eight great- great grandchildren. Also surviving are his brothers, Bernard and Ephren Jr.; along with his sisters, Ruby, Betty and Emmie. Funeral services will be held at Heyl Funeral Home at 11:00 a.m. on March 23, 2019 with Aaron Blankenship officiating. Friends may visit with the family one hour prior to the service at the funeral home. Burial will follow at Nankin Cemetery.